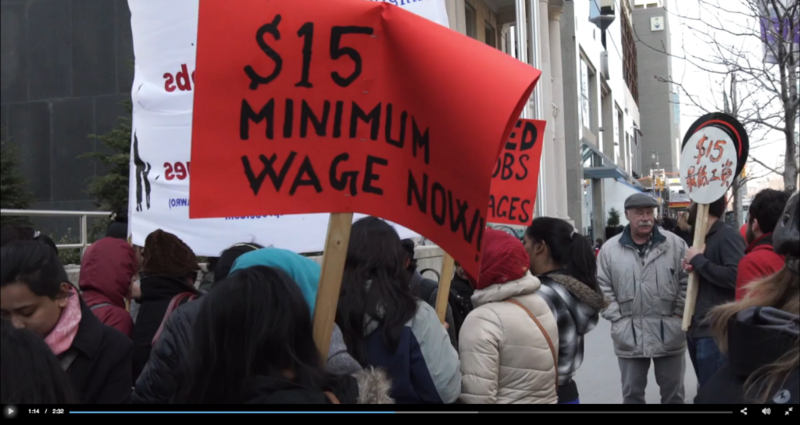 Today, the Toronto Star published a new video to mark October 7, which is the World Day for Decent Work. “Over half of all workers in Toronto face some kind of instability on the job: Short-term contracts. No benefits. Erratic schedules. The city is now the most unequal in Canada…”. As reporter Sara Mojtehedzadeh explains, the Ministry of Labour’s review of our labour laws presents a once in a generation opportunity to improve working conditions for us all. Click here to watch and share the video on Facebook. 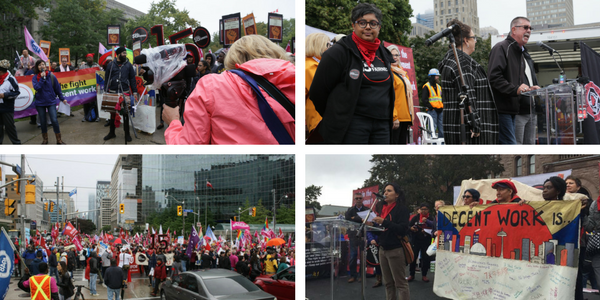 We kicked off a week of action together with 5,000 workers and activists last Saturday at Queen’s Park. WAC members and allies gathered for a pre-rally, and occupied the intersection of College/University to call for a $15 minimum wage. 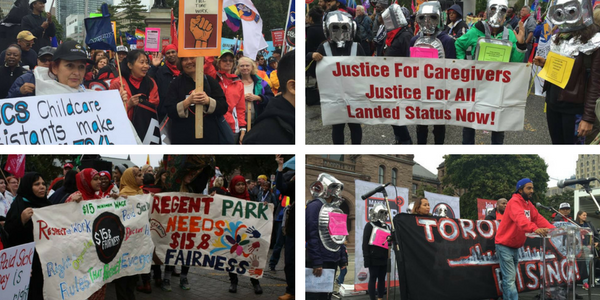 Then we all marched to Queen’s Park to attend a huge rally organized by the Fight for $15 & Fairness Campaign and the Ontario Federation of Labour. Many workers bravely spoke up and shared their experiences including our WAC leader Erendira. To see the coverage of the rally by CityNews click here. Buses arrived at Queen’s Park from over 25 cities bringing both unionized and non-unionized workers together from across Ontario. We were thrilled to see allies from different corners of the city including Regent Park, Rexdale, Scarborough as well as caregivers, hotel workers and educators. To see more photos from the rally click here. The rally was just the beginning of our week of action on Decent Work. On Monday, farm workers organized the final event for the Harvesting Freedom campaign in Ottawa. Workers also organized events in Peterborough, Ottawa and Sudbury. WAC joined an action at Pearson Airport in solidarity with airport workers. Meanwhile health providers hosted a forum at St Mike’s Hospital, the Ontario Federation of Labour organized a day-long lobby at Queen’s Park and faith leaders held a prayer vigil and distributed their statement in support of $15 & Fairness. 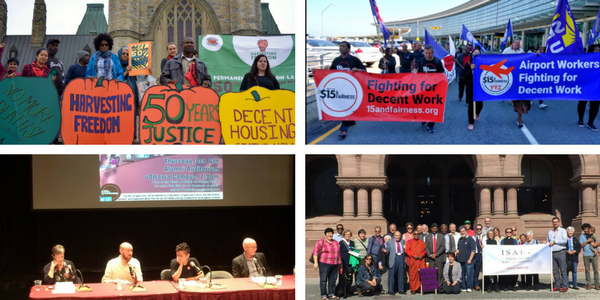 After such an amazing week of action, we need your continued support to improve working conditions for all workers in Ontario! The Ministry of Labour is accepting responses to the Changing Workplace Review Interim Report until next Friday.Please download the sample letter today and endorse the WAC & PCLS report, Building Decent Jobs from the Ground Up, in your response to the Special Advisors.